After Gloucester Police Chief Leonard Campanello learned in March that another resident had overdosed and died after taking heroin, he’d had enough. He posted a note on the Police Department’s Facebook page, asking the public to call the station if they saw drug activity. He also reached out to those struggling with addiction. When the chief checked the readership on the message, he realized he had struck a nerve: It was viewed by 37,000 people, 8,000 more than Gloucester’s entire population. That pushed him to meet with other city officials and residents to discuss opiate addiction, which has long been a problem in this storied fishing village. Any addict who walks into the police station with drugs or equipment and asks for help will not be charged with a crime. The chief decided it was time to stop arresting addicts and start helping them. “We can’t arrest our way out of this problem,” said Campanello, a former Saugus cop who was named chief almost three years ago. “The war on drugs from the supply side is over, and we lost, and the police can be part of the conversation on the demand side. He announced the police’s Angel Program, which fast-tracks addicts into detox programs. Since it began on June 1, 36 addicts have followed the program’s simple protocol, which allows anyone to walk into the station and express a desire to go to rehab. The addict is then paired with a volunteer “angel” who guides them during the intake process. At the station, officers work with Addison Gilbert Hospital in Gloucester and the Lahey Health network to help find the right program. Within hours, the person is usually sent to a detox facility. Because Campanello doesn’t want money to be an obstacle to treatment, the Police Department uses a fund created with money seized from drug dealers if an addict doesn’t have insurance or can’t afford a co-payment. In addition, Campanello worked with local pharmacies to make nasal naloxone, or Narcan — which reverses heroin overdoses — available without a prescription at little or no cost. 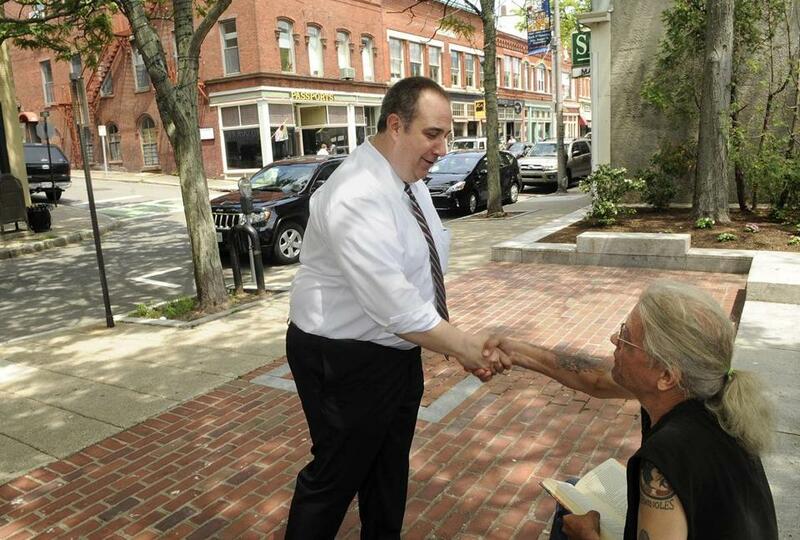 Gloucester Police Chief Leonard Campanello greeted Adelard Charron, a former addict who is now in recovery, on Main Street last month. On a recent day, Campanello strolled down Main Street and heard feedback from residents about the program and its success. He spoke with Adelard Charron, who was addicted to the prescription insomnia drug Seconal but quit three years ago. Charron said the program, which fast-tracks people into detox, is exactly what addicts need. In the spring, Campanello traveled to Washington and met with US senators Elizabeth Warren and Ed Markey and US Representative Seth Moulton in a bid to gain support for the program. He also is lobbying the federal government for an increased share of money seized from drug dealers that is given to local communities for use in recovery and prevention services. Like the rest of the state, Gloucester has been hit hard by the heroin epidemic. Last year, at least 1,000 people in Massachusetts died from heroin and opiate-related overdoses, a 33 percent increase in deaths from 2012. In 2014, 11 died from overdoses in Gloucester, and already this year, six heroin-related deaths have been reported in the city. In addition, 62 people who overdosed and might have died in Gloucester were revived by naloxone in the first six months of 2015, compared with 77 during all of 2014. “Gloucester has had enough, and I think the people have had enough,” said Mayor Sefatia Romeo Theken, who said she is tired of seeing city residents taken from homes in body bags after overdosing. Like the chief, the mayor believes it is time to remove the stigma that society has placed on addicts and their families and to view addiction as a disease. “I want to change the way we look at each other,” she said. Talk to locals and they will tell you that for decades, heroin has been around this old fishing port. In the 1980s, it was a drug of choice for some fishermen and dock workers. According to Gloucester’s Gary Langis, who helps people access detox and naloxone, more people have turned to heroin in recent years after opiates such as oxycodone soared in price and became less available on the market. Heroin, which can be bought in $20 and $40 bags, is available everywhere across the state, said Langis. 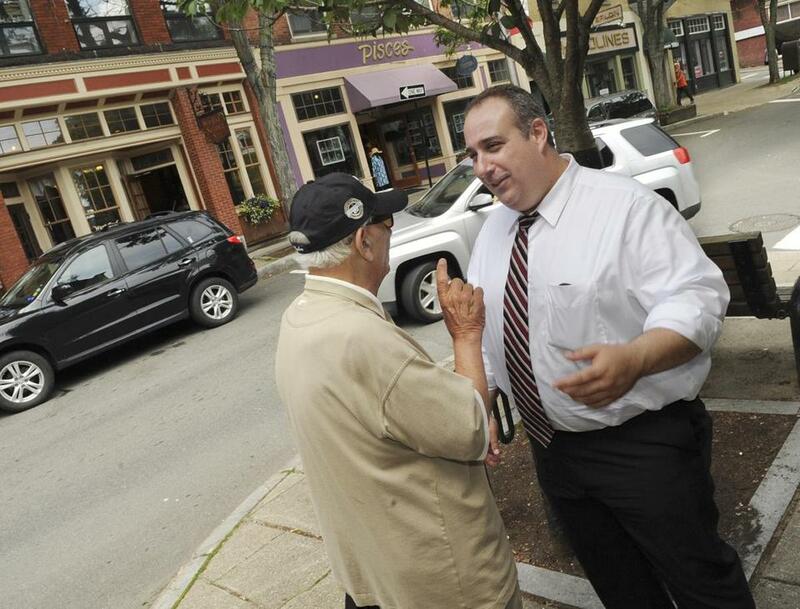 Campanello (right) talked with resident Frank Iacono on Main Street in Gloucester. Campanello’s community outreach included a recent meeting with members of Learn to Cope, which gathers every Wednesday night at the Rose Baker Senior Center in town to provide support and resources to those who are struggling with someone else’s addiction. Kathy Day, the group’s regional manager, said local law enforcement’s shift from judging those in the midst of addiction to offering help has brought comfort. Over at the Crow’s Nest, a waterfront bar, Allison Mondello said Gloucester and other communities need to take the opiate epidemic more seriously. “I have, as everybody does, a few opiate addicts in the family, and I’m for anything that will help,” said Mondello. She took a sip of water and paused. “I myself got a little too heavy into the pain pills and had to go to detox. It was for percocets,” she said, describing an opiate similar to oxycodone. “Did you know?” she asked the woman who sat at the next stool over. “I didn’t,” the woman said. Her friend rose and wrapped her arms around Mondello. Then both women closed their eyes and cried.